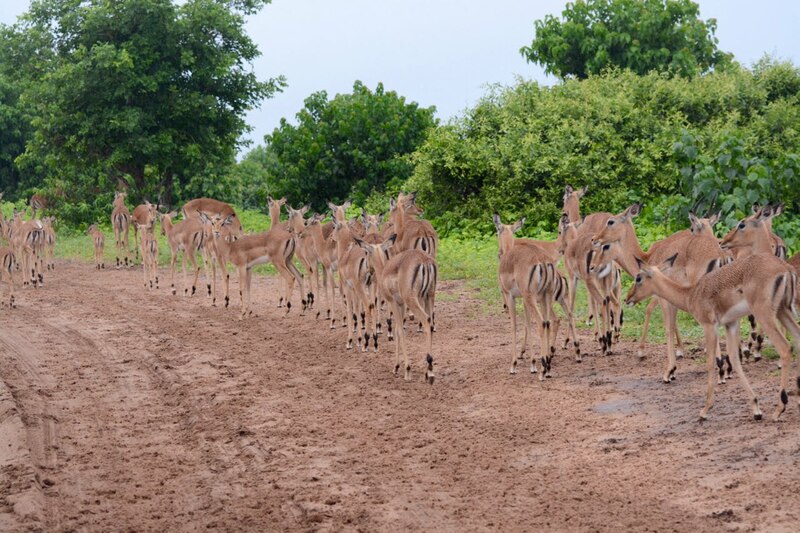 Seeing so many animals on a safari makes you kind of take them for granted but it really is amazing to see something like this herd of impala - probably 200 of them - trying to block the road in front of our truck. 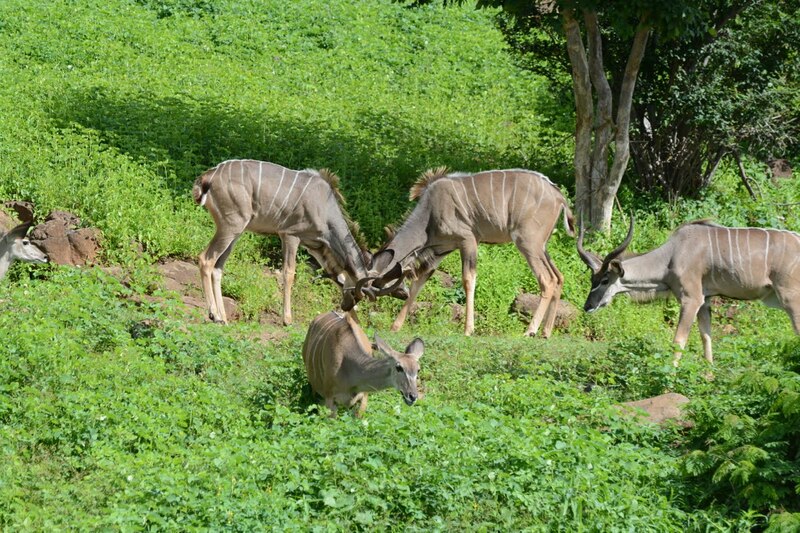 From a short distance away they really blend in to the surrounding terrain. It had been raining heavily and if you can see the ruts in the road you'll know why we were happy we weren't driving our own car! Zebras are my favourite animals to photograph - it's like they've been ready all day just waiting to have their picture taken. 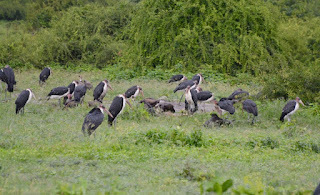 There was a group of about 50+ marabou and vultures obviously having a feast on something very tasty that we couldn't see. Whatever the lions left them I suppose. 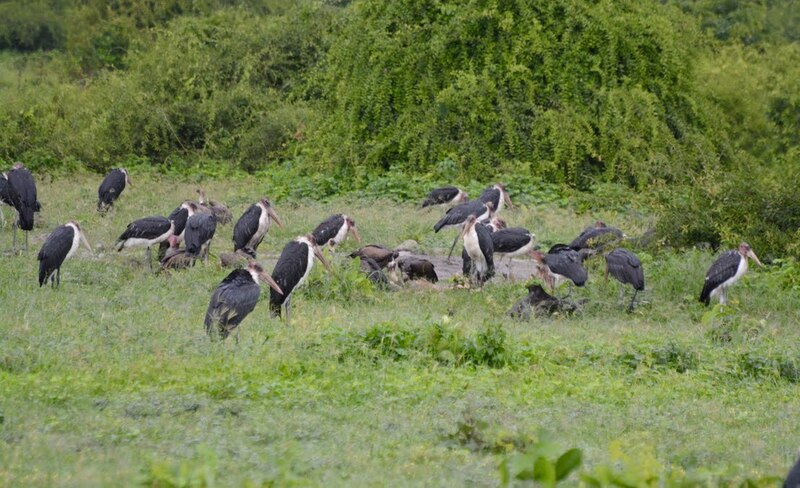 Marabou storks are also known as undertaker birds and they look quite pitiful standing around with their black cloaks. Another highly photogenic animal - the majestic giraffe. The 2 male kudus are just play fighting. 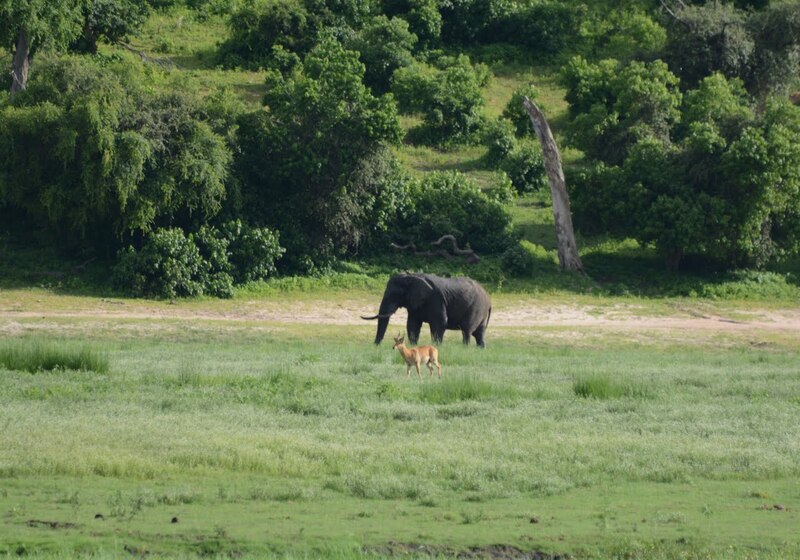 Elephants and other animals frequently come down to the river but not so much when it's been raining. Scott was careful not to get too much of a close up - he really needs to get a telephoto lens! This beautiful bird (ground hornbill) appeared at the side of the highway - it was about a meter tall. Outside our hotel in Victoria Falls these 2 young warthogs were also having a tussle. 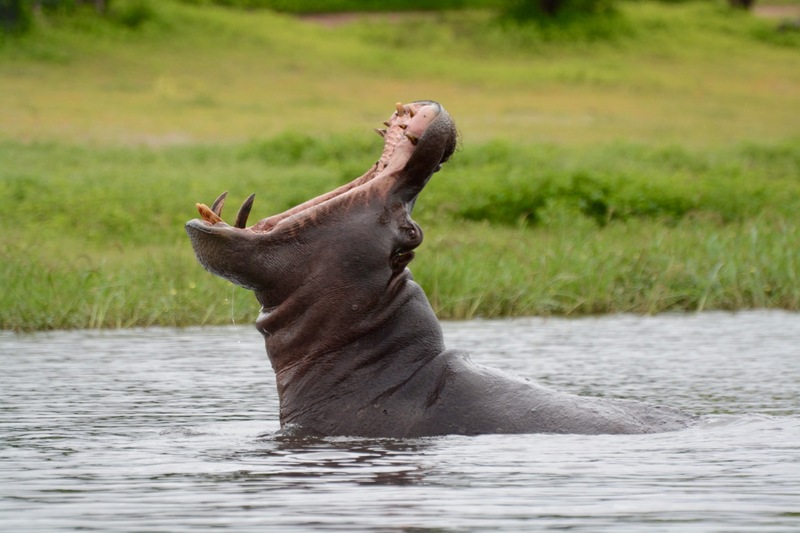 To say there were hippos are far as the eye could see might be a slight exaggeration but not far off. Lots of families with young ones. 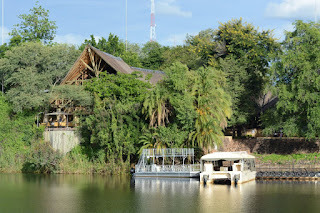 Chobe Safari Lodge from the river. We stayed 2 nights there. Cape Town is a beautiful city - ocean, mountains, beaches, great restaurants, wineries. And even though this is our 4th time here, there are still several areas we haven't been to. Sam's mom and dad came down from J'burg for a few days and it's been great exploring and visiting with them. 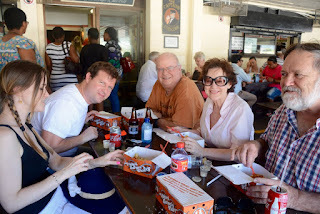 On Sunday we took the hop on hop off bus out to a winery, then fish and chips at Hout Bay followed by dinner at a restaurant overlooking the Atlantic. Nice view of Table Mountain from the bus. 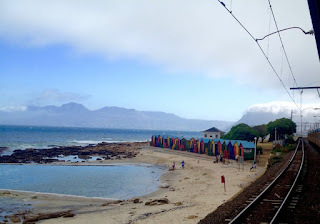 Monday after breakfast we hopped on a local commuter train for an hour ride out to Simon's Town. The train was covered in graffiti but seemed pretty clean inside. Coming back into the city in the late afternoon it was pretty crowded. The trip had some beautiful scenery by the ocean and included a saxophone player, a couple singing hymns and a group getting escorted off (likely hadn't paid). These are the multicoloured 'change huts' that you sometimes see in promotional photos of the area. 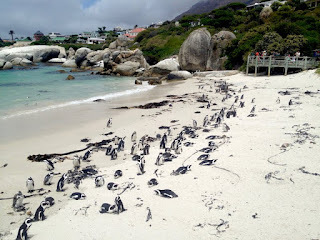 We spent some time visiting the tiny penguins at Boulder's Beach before getting a taxi back to the station. We were all entertained by the 'discussion' Sam got into with the taxi guy. 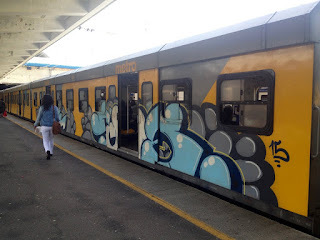 Taxis in SA are not like you would expect - they developed out of an informal system of transportation for blacks and coloured people. They have 2 operators - the driver and another guys who sticks his head out the window and yells to people on the street to see if they need a ride. The mini bus (taxi) might have room for 12 passengers but will typically carry up to 20. 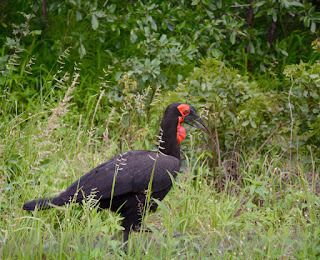 They drive down the road honking and whistling to attract passengers. Sam was insistent that before we got on the guy should guarantee there was room for the 6 of us. He assured us there was but after we got on, he had no where to sit so Sam was more than a bit upset with him. Lucky for us he didn't throw us all out (which is known to happen). 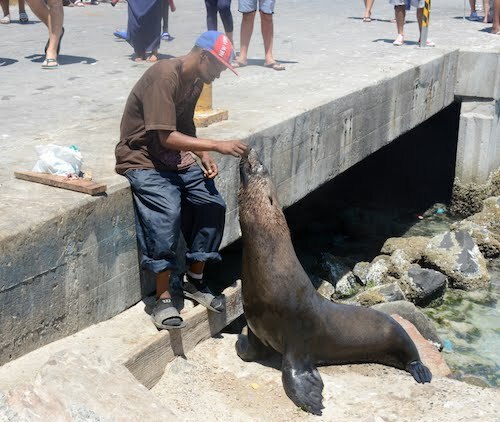 This guy was feeding the seals and holding out a box for donations. Monday evening we headed up to Signal Hill for the sunset, with some friends of Scott and Sam's. Signal Hill is one of the higher spots in Cape Town, just below Table Mountain and obviously a popular place to watch the sunset. We spread out our blankets and enjoyed a lovely picnic that Sam had prepared. 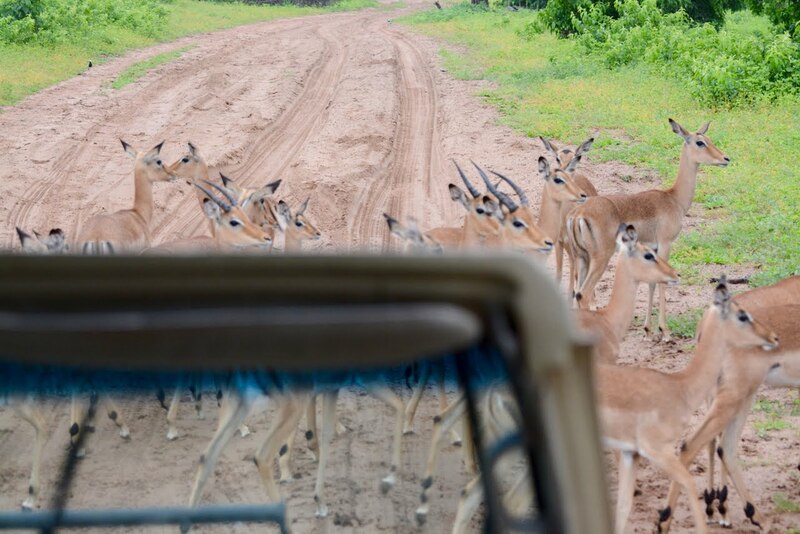 Driving over the Botswana border in our rental car was a bit of an adventure. First we (and by we I mean Scott) had to go to the police station in Vic Falls with the guy from the car rental company in order to get permission to take the car out of the country. When we got to the border more forms had to be filled out for both us and the car. A fee for driving on the roads needed to be paid and in order to get back into Zimbabwe we had to pay an additional $75 US each (which we'd already paid once at the airport). Apparently Canada charges the Zimbabweans exorbitant Visa fees so they are retaliating! Our lodge was located in the small town of Kasane which is just a short drive from Chobe National Park. 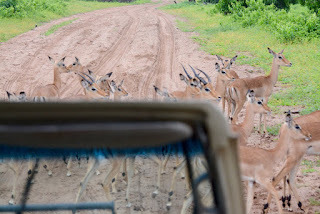 The first morning we had scheduled a game drive to start at 6 am. 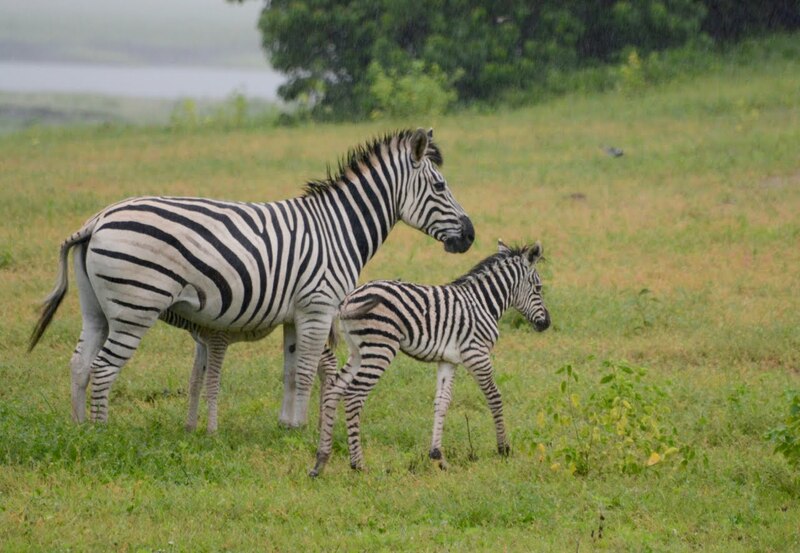 Unfortunately it was pouring rain most of the morning so the animals were not very happy to come out that early! Probably the most exciting part was before we even left the lodge. As with most lodges in tropical climates, the lobby is open to the outdoors. 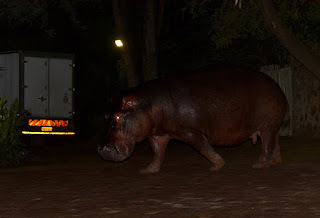 As Ross and I were waiting for the driver, we looked up to see a hippo approaching the lobby. Since hippos pose the greatest threat to people in Africa (despite looking kind of cute and innocuous) I kept my distance though managed to take a few pics. 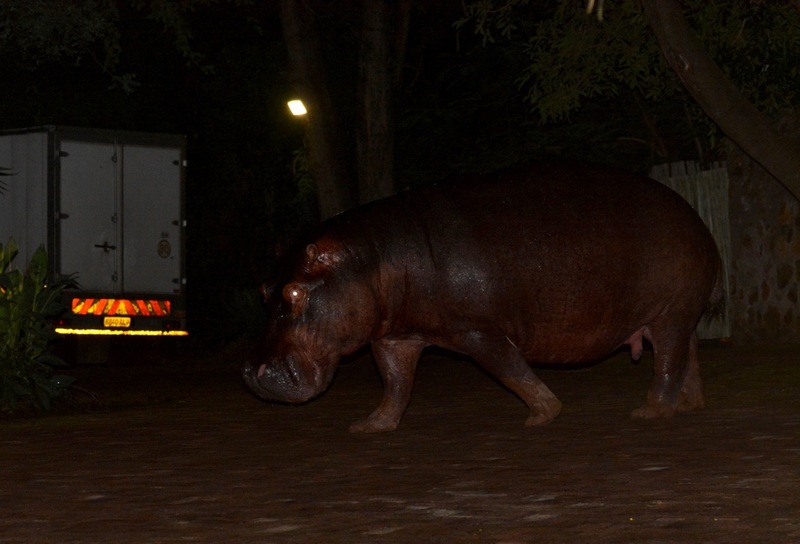 It was still quite dark and the staff shortly came out and 'shooed' him away. He then headed towards our car in the parking lot and likely could have done a far amount of damage if he wanted. 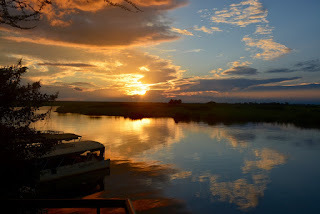 We had a couple of 'boat safaris' on the Chobe river which forms the border between Namibia and Botswana. 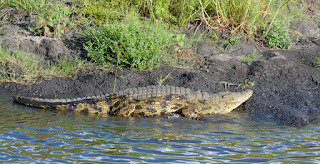 Our guide pointed out about 20 different bird species; TONS of hippos, and a many crocodiles. 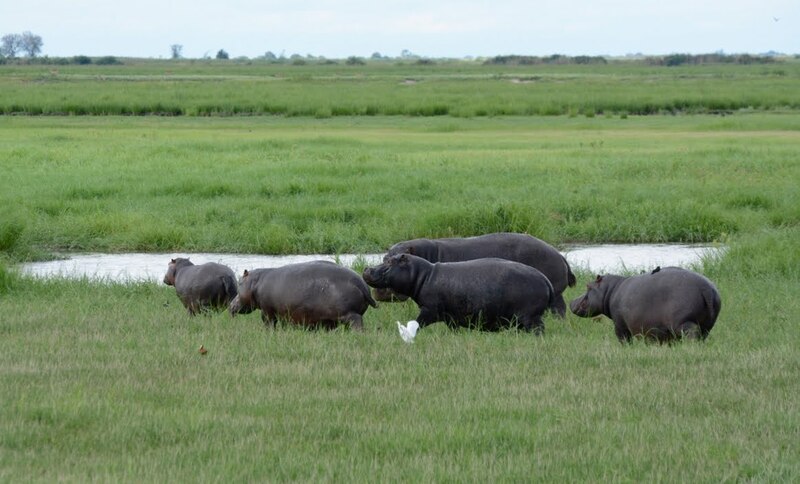 The boat driver seemed more cautious around the hippos than the crocs. Lots of warthogs (they seem to be a nuisance in town), mongooses (mongeese??) and even an elephant on the side of the highway as we drove in. Our helicopter ride over the falls was postponed a few times due to weather but when we finally rose into the skies it was worth the wait. The view of the falls was spectacular of course and we continued down the Zambezi looking for animals. It was like being in a Nature channel movie - several large herds of elephants, zebras and giraffes, a very large herd of buffalo. Quite a different perspective to see them from the air. 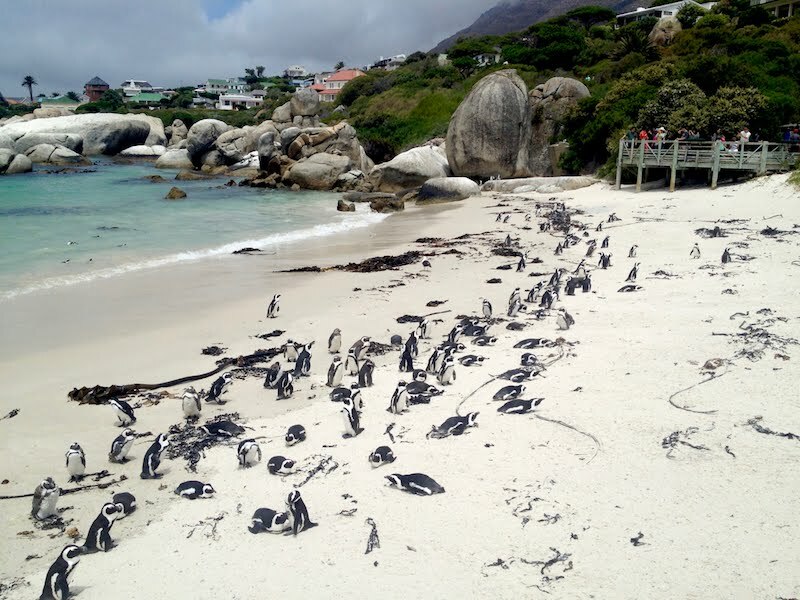 If you have one, definitely add this adventure to your bucket list. 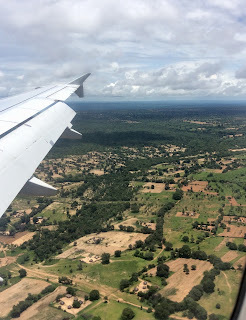 Flying in to the Victoria Falls airport it was apparent that this country has not recently been facing drought. Green and lush, the countryside appeared to be doing nicely. 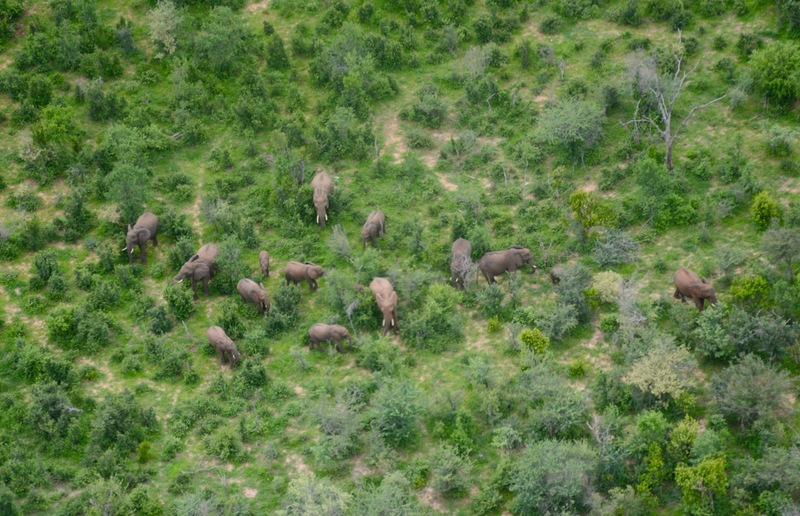 As well, from the air you might be able to see small, round buildings known as rondavals. So in order to be that green it must rain a lot which meant our helicopter trip has been postponed indefinitely as it is pouring. Earlier we walked through the park which provides some stunning views. The waterfalls seem to continue forever, almost 2 km in length. The mist was billowing, often making it difficult to see the falls and giving us a bit of a shower. The rain held off until we had finished the hike. Our hotel is gigantic with many water features. 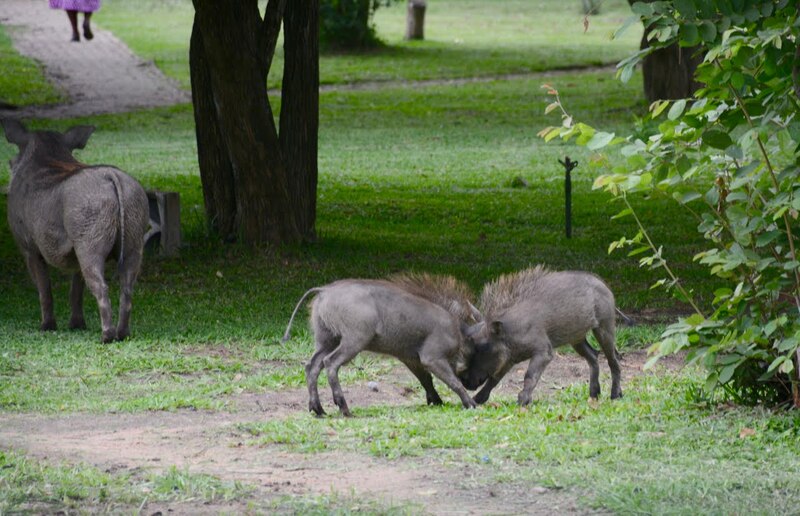 We were advised not to leave our balcony doors open as the baboons and monkeys will enter. So far none have come in! 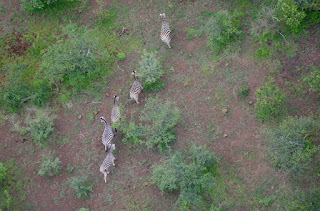 But we've seen a few around, on the road, in the park and, according to Scott, running along the roof of the hotel. Still waiting for the helicopter trip!! Waterfalls are categorized by height, width, and volume of water. 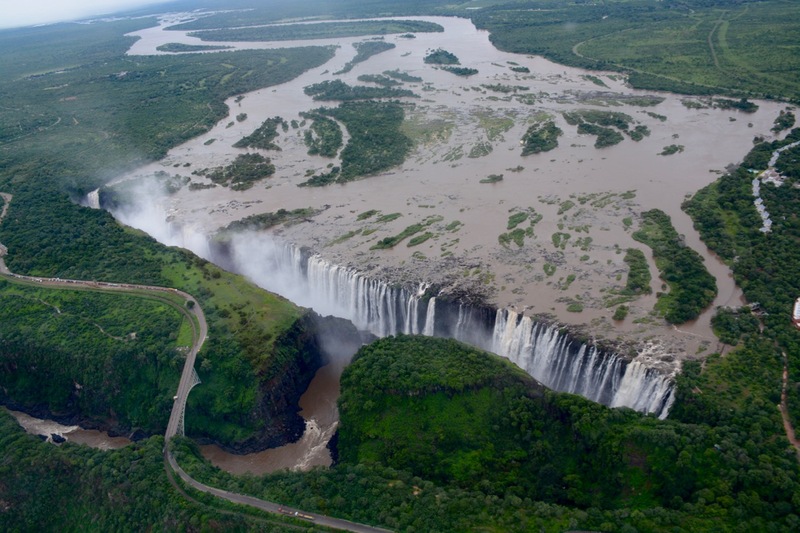 Victoria falls doesn't rank at the top based on any of those features but is said to be the 'largest' because of its combined height/width. It lies on the border between Zimbabwe and Zambia and is part of the Zambezi river. We arrived in Zimbabwe yesterday, and as Sam mentioned, is the first dictator run country we've been to. Framed photos of Robert Mugabe greeted us at the airport and the hotel and I'm thinking most public places. Lat night we had a very relaxing sunset cruise on the Zambezi - tons of hippos (literally!) and a few crocodiles. The main cultural group in Zimbabwe are the Shona people. We were greeted outside the airport by this group of singers/dancers. Their music is very rhythmic, lots of call/response and multiple harmonies. Another group of musicians entertained us at the boat dock. 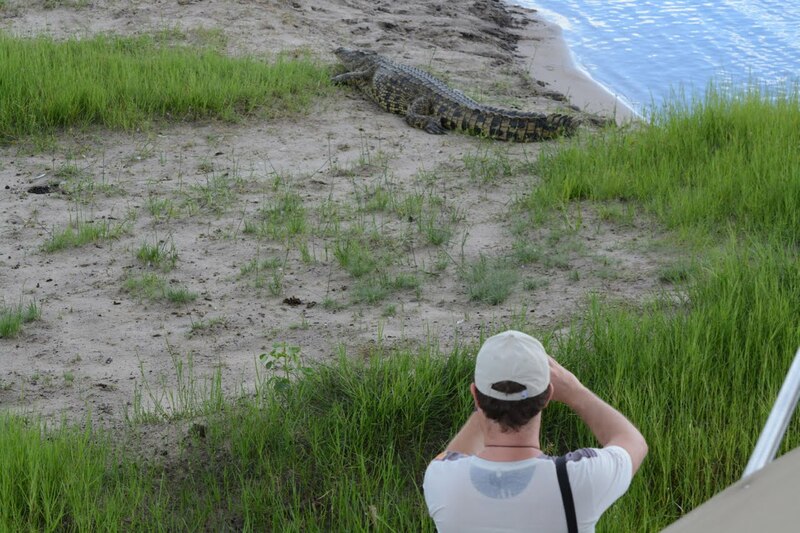 The Zimbabweans we have encountered in the tourist industry have all been exceptionally pleasant and accommodating. I suppose with an unemployment rate hitting 80% they quickly learn what makes the tourists happy! As expected, there are a lot of street vendors that can be quite aggressive at times. 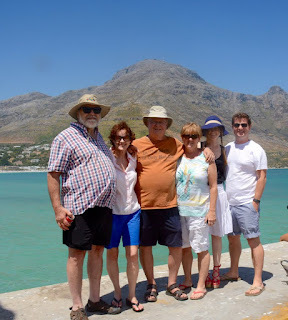 On Sunday, just outside of Cape Town, we visited a large, historic estate winery for lunch - Vergelegen. 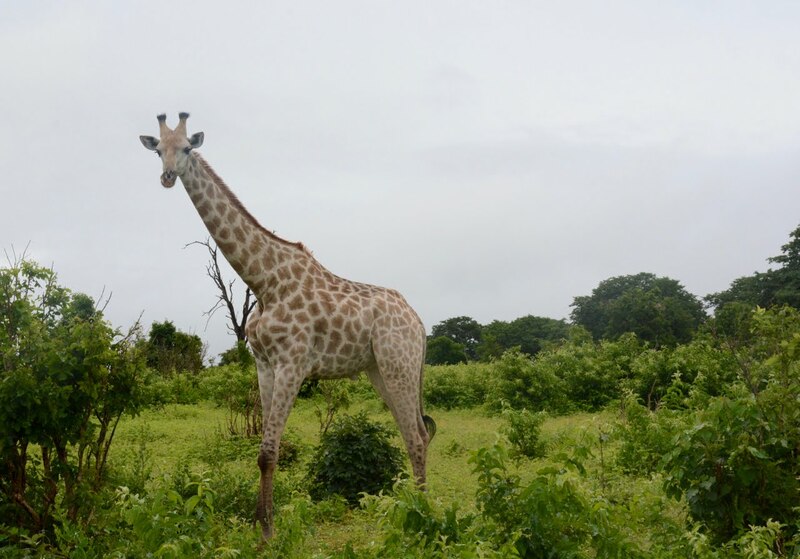 It was founded in 1700 and has large, beautiful gardens; camphor trees planted hundreds of years ago and a lot of 'museum-type' displays showing the history. Just heading out for our helicopter ride that was delayed due to weather (cloudy, a bit of rain). Hopefully have more pics to post from that!